Happy “dog days” of summer! Where does the time go? Fear not! 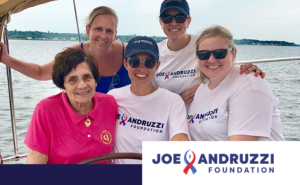 The Joe Andruzzi Foundation has plenty of exciting events and initiatives to look forward to in August – before we turn the page on July, here’s a recap of the month that was! That’s right – the Joe Andruzzi Foundation’s gala is moving to a Thursday night! Be sure to mark November 15, 2018, on your calendars to save the date for our 11th annual gala, presented by The J. Derenzo Companies and once again hosted at Gillette Stadium’s Putnam Club (West)! Last Thursday, JAF staff and board members were joined by Foundation supporters at Towneship Restaurant in North Easton, MA for our annual gala kickoff where the group discussed plans and exciting details about the upcoming event. We want to thank David and Karen Howe and the incredible staff at Towneship for hosting us for the kickoff, as well as our patient speaker, Carrie Letham, who shared her cancer journey with attendees. November 15th will be here before you know it, so be sure to keep an eye out later this summer for more details about JAF’s 2018 gala! Click here to learn more! JAF Night At The PawSox: Tix Going Fast! 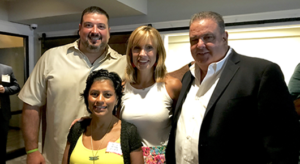 Join the Joe Andruzzi Foundation and the Pawtucket Red Sox for a “JAF Night at the PawSox” outing on Saturday, August 4, at McCoy Stadium in Pawtucket, Rhode Island. A limited number of general admission tickets for the PawSox vs. Rochester Red Wings game (6:15 PM) are available to Foundation supporters at a very special rate – just $10 – with $5 of each ticket purchased through the link below benefiting JAF’s mission to alleviate cancer’s financial burden on patients and families throughout New England! When you purchase tickets through this special JAF promotion, you will also receive access to a bunch of extras and goodies! Follow the link below to learn more and score your tickets while they last! Get tickets here! 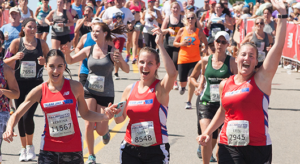 This August, 60+ Team JAF charity runners will represent the Joe Andruzzi Foundation at the New Balance Falmouth Road Race – all to raise funds in support of JAF’s mission. We need YOU to help our runners reach their fundraising goals! To donate, visit www.teamjaf.org and scroll down/click on the name of a runner you wish to support. In possession of a Falmouth bib? While Team JAF’s charity entries have been claimed, we are still accepting applications from those who have independently secured a Falmouth Road Race bib and wish to run and fundraise ($500 minimum) as part of a non-profit team. To apply, click this link. When Colleen Cekovsky was diagnosed with cancer, the 39-year-old Westfield mom had just gotten through her husband’s deployment to Afghanistan. 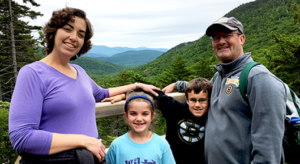 Learn all about the Cekovsky family’s inspiring cancer journey in the latest JAF Patient Story by clicking this link. JAF: How did you hear about the Joe Andruzzi Foundation? What made you want to get involved as a Champions Circle member? Brian Kern, Regional Vice President, TierPoint: One of our primary partners, ROI Communications, is a major supporter of the Foundation, and they asked us to get involved. It was an easy decision – supporting cancer patients and their families is a cause we all want to help with. JAF: How does Champions Circle align with TierPoint’s philanthropic focus? Brian Kern: One of the core values of our company culture is family. For us, the concept of family is very broad and inclusive; it covers not just our immediate families but our colleagues and communities as well. That lines up very well with JAF’s mission of providing ‘help, hope, and a reason to smile’ – to both New England cancer patients and their families. JAF: Anything else you want people reading this to know about TierPoint? Brian Kern: We’re very proud to support this wonderful organization and the great work it does. We look forward to doing our small part to help JAF achieve its mission.